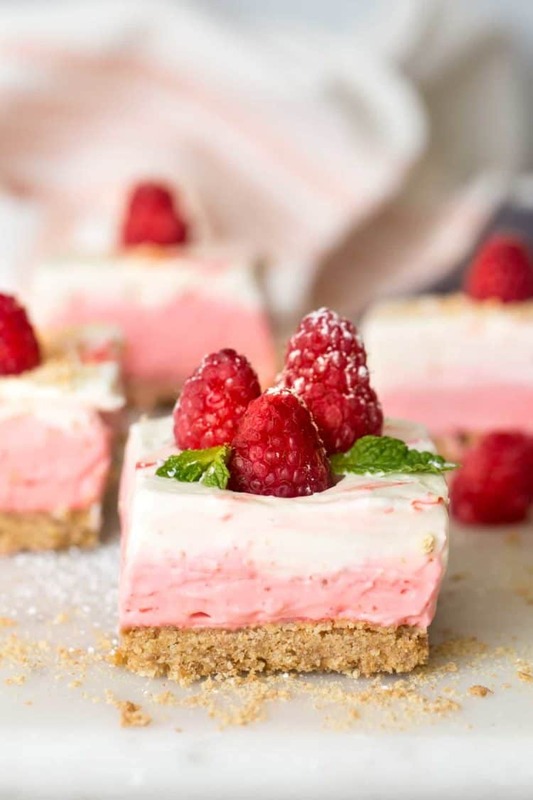 The recipe for these easy Layered Raspberry No Bake Cheesecake Bars is phenomenal! These gorgeous no-bake bars are so quick to make and will be a hit with kids and adults alike. This dessert can be served as cheesecake bars or in the baking dish. Try these other no-bake desserts: The Chocolate Oreo Pudding Delight, or No Bake Berries Ganache Dessert, and the Wafers and Pudding Dessert. Pin this HERE! Follow Valentina’s Corner on Pinterest for more inspiration! Who loves an amazing traditional cheesecake recipe? This girl here! I love myself a good homemade cheesecake. This recipe is seriously the best because it doesn’t require you turn on the oven. Yes, please. 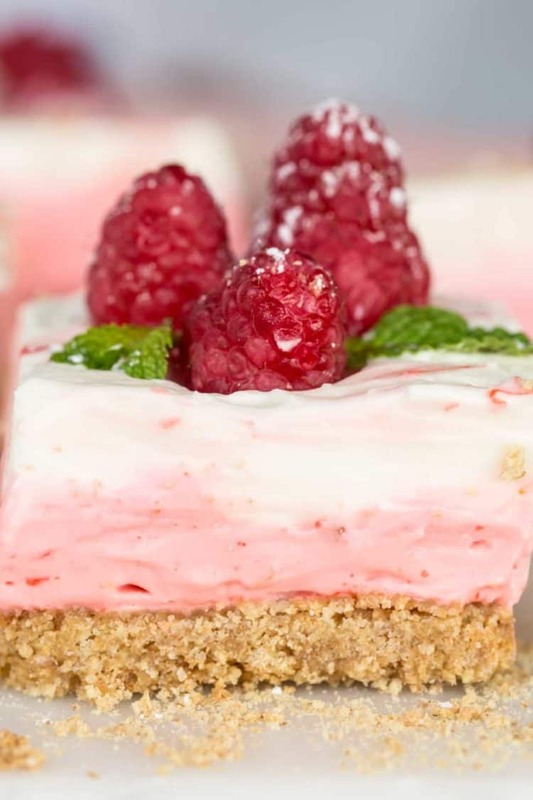 Graham crackers layer with a creamy mousse-like raspberry layer and cream cheese layer topped with fresh raspberries. It truly doesn’t get any better than this homemade recipe. Don’t be intimidated by the instructions, this cheesecake truly is so easy to make. Combine crushed graham crackers with sugar and butter. Transfer crust mixture to a baking dish and gently pat down. Refrigerate crust. TIP: Be sure cream cheese is room temperature and heavy whipping cream is cold. In a large bowl, beat cream cheese with sugar and sour cream until creamy. In a separate bowl, beat heavy whipping cream until stiff peaks form. Add the whipped cream to the cream cheese and beat on LOW speed just until combined. Refrigerate mixture. In a saucepan, combine water with the raspberry gelatin. Once gelatin is melted, remove from heat and set aside to cool completely. TIP: Don’t wait too long or the gelatin with begin to thicken and you’ll need to reheat it. Divide the cream cheese mixture evenly into two bowls. Pour the cooled raspberry gelatin into one of the bowls and beat on LOW speed just until combined. Take out the refrigerated crust. Spread the raspberry cheesecake mixture evenly over the crust. TIP: Add the mixture in spoonfuls over the crust here and there for easier and even spreading. Take cream cheese mixture and repeat. Add the mixture in heaping spoonfuls sporadically over the raspberry layer. Gently spread over the raspberry layer. DECOR: This step is optional. I left a tablespoon of the raspberry gelatin in the saucepan, then took a spoon and made little droppings throughout the top layer. Then with the back end of a spoon or toothpick, make swirls for decor. These cheesecake bars are borderline cheesecake and mousse. The texture of the layers isn’t thick like a traditional cheesecake is expected to be. The whipped cream adds a creaminess to the layers and it’s heavenly! Truly heavenly (food heaven ..haha, yes, that’s a thing). 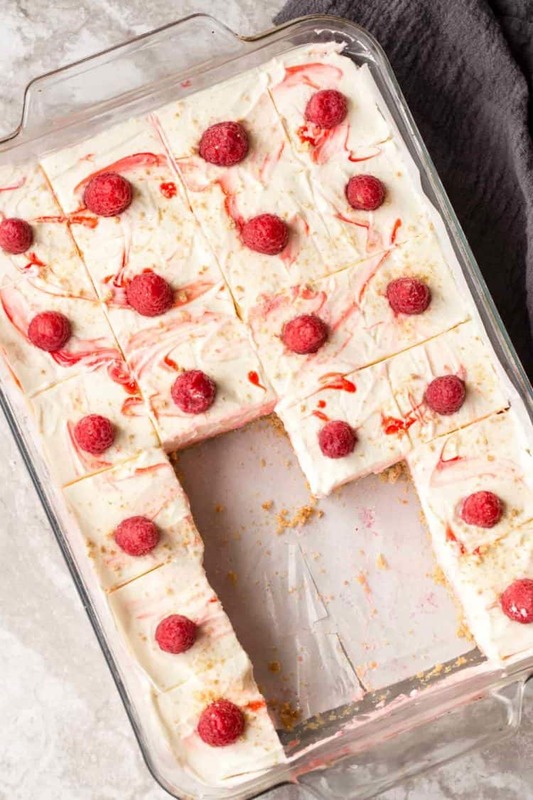 TIP: Before adding the raspberries to the top, lightly go with a sharp knife and create bars so you have a template and can place raspberries in the center of each square. Then, all you’ll have to do it cut all the way through before serving. Genius, right? Oh stop it, you’re so kind and making me blush. Removing the first bar may be challenging, just warning you. The rest will come right out. 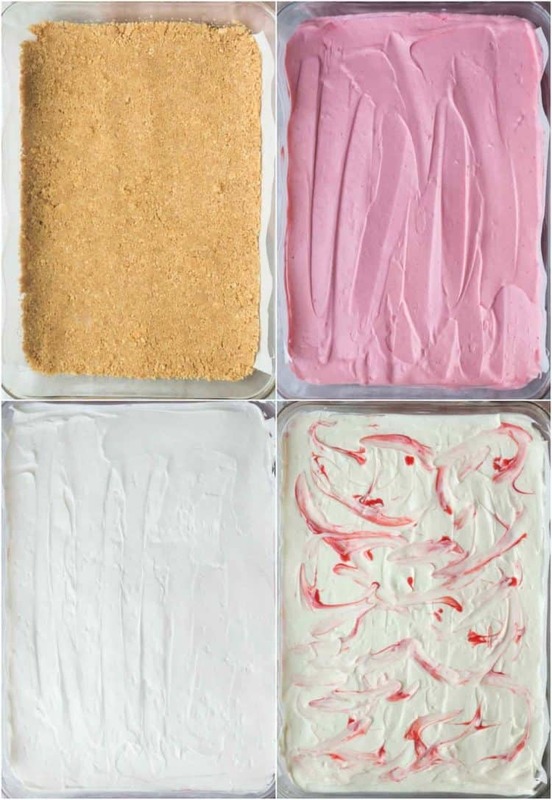 Enjoy dessert as bars (mini dessert bites) or keep in the baking dish and spoon out the mixture. GETTING TO KNOW YOU: What’s your favorite cheesecake topping? Tools used for this recipe: glass casserole dish, parchment paper, hand blender, bowls, mixer, icing spatula. 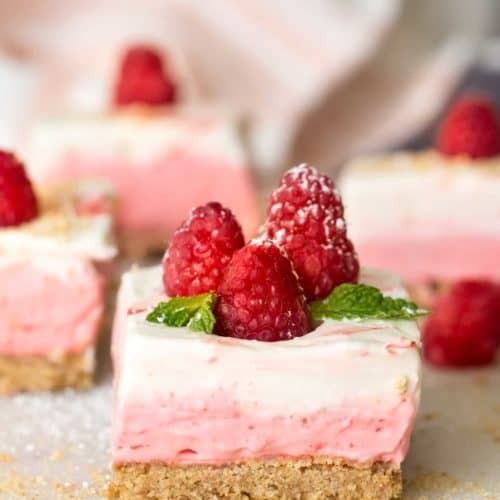 Recipe for Layered Raspberry No Bake Cheesecake Bars. Easy graham crust layer, with a raspberry and cream cheese layer and topped with fresh raspberries. Line a glass casserole dish with parchment paper and spray with baking spray. With a hand mixer, crush the graham crackers and place into a bowl. Add sugar and melted butter and mix. Transfer to the dish and press down to form the first layer. Refrigerate crust. In a large bowl, combine cream cheese, sugar, and sour cream until creamy. Add the whipped cream to the cream cheese mixture and beat on low speed just until combined. Refrigerate cream. In a saucepan, combine raspberry gelatin and water. Cook until gelatin bubbles and completely dissolves. Remove from heat and allow to cool completely. 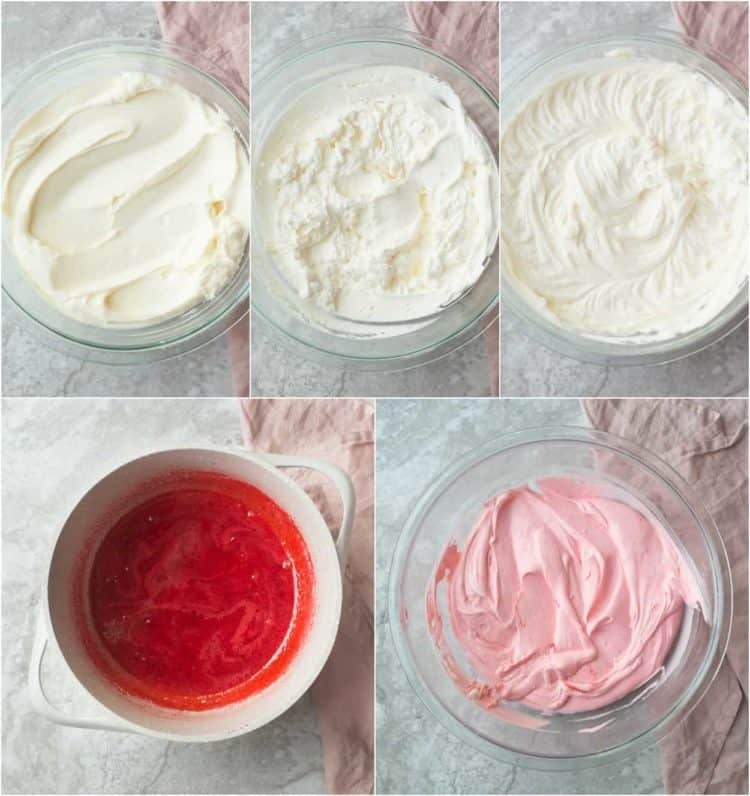 Divide the cream mixture evenly into two bowls. Add the cooled raspberry gelatin to one of the bowls. Beat on low speed until combined. Add the raspberry cream over graham crackers layer, spreading evenly. Add the cream cheese layer over the raspberry layer, spreading evenly. Refrigerate cheesecake (at least 3 hours). Top with raspberries before serving! I just wanted to get back to you and let you know that everyone loved your dessert! We had it for our Christmas get together and it is completely gone!! So many compliments too! Thanks for sharing it! cups do you think that would be? Thank you. Hi, Kim. You’re in for a treat. You’d need about 2 1/4 – 2 1/3 cups crushed crackers for this recipe. I hope you love it as much as we do.